About a month ago, our Stake had a Mother/Daughter Campout. Mattie was very excited to go, and since our Stake now has air-conditioned cabins, I decided that I could handle a night of "camping" with Mattie! I had already been camping this summer at the new camp site, and it was pretty sweet. I was once again the Camp Director for the YW in my ward this year. I survived that, so I knew that I could make it one night with Mattie, even if I was 7 months pregnant at the time! 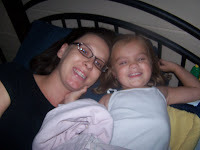 This was our first actual Mother/Daughter Campout. 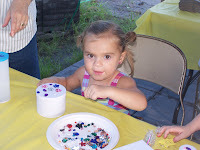 Last year we got rained out and had a craft night instead. Like I said, Mattie was very excited to be going camping, and to be able to spend the night with all of her little friends. We got there on Friday evening, and picked out a cabin that would be big enough to hold all of our friends. We set up and had fun helping our friends get set up too. We got our fire going for dinner. I brought stuff to make tinfoil dinners, and had everything pre-made and ready to go. Of course all of the other mothers brought something fast like, hot dogs! So, poor Mattie had to wait forever to eat her food, but it was so good (Mo probably would have preferred the dog). 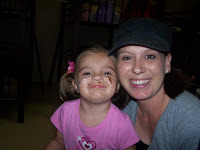 We did s'mores that night and then went into the cabin so that Mattie could play with all of the other little girls. She had a great time climbing from one top bunk to another. The moms had a fun time talking and visiting. After awhile we decided that it was time for bed, so Mattie crawled into bed with me. It took me a little while to get her to calm down and go to sleep. After she fell asleep, I hoisted her onto the top buck. I didn't get much sleep that night, and I don't really know why. I wasn't uncomfortable, but I just couldn't fall asleep! 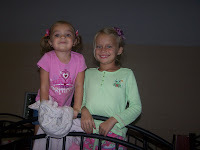 I think that I was a little nervous with Mattie being on the top bunk. She had never slept on a bunk bed before, and I think that maybe subconsciously I was scared of her falling or something! Anyway, I finally fell asleep and got about 4 hours! In the morning, we had a pancake breakfast provided by the Stake, and then crafts. Mattie went to do crafts with my friend Shelly, while I packed up our stuff. I was very tired and ready to go home and get some rest! I did catch the tail end of Mattie making her crafts. Mattie was so excited about the little jeweled box she made for me! I of course loved the box. We went back to the cabin and finished cleaning up our stuff, and then headed home. I had a great time with Mattie, and I'm very grateful that she is my daughter. I love that she has joy in the small things. She has so much energy and uses her body to the max each day! I thank Heavenly Father that He sent her to us, because I couldn't imagine my life without her! This is such a fun idea! I would love to do this with my girls. Mattie is such a sweetheart...it looks like she had a great time too. I just realized I won't ever get to do a mother/daughter campout! :( Maybe I can tag along with you and Mattie some time! Mattie's smore face is too cute! I love it that the kids could play in the cabins! Sounds like a lot of fun! Hey Heather! 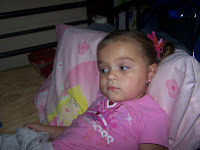 Its Ashley "Maxwell" Gooch I found your blog on Marias page. Hope you don't mind that I added you guys to ours! I bet that was a blast for you in Mattie, and how nice you got to sleep in a cabin! Can't wait to go with Violet :)! I would be scared of Mattie falling off the top too! Loved the pictures :). I cant wait til those fun days come around! looks like it was a blast. you and mattie are so cute. yes, baby #2 is on the way. =) hope you and steph are feeling ok.